Happy new year! For many readers of Encouragement From The Word, including myself, the past couple of weeks have been, well, ‘eventful’ is the word that comes to mind. Along with all the usual preparations for Christmas, whether for services or big family get-togethers, many of us dealt with the after-effects of a significant ice storm. Some only saw their lights flicker a few times, while others experienced multi-day power outages; a few unfortunate souls in Toronto might still be awaiting a hydro hookup. It’s been a Christmas season to remember, for many reasons. As with the last major power outage I experienced, back in August 2003, what this did for me was make me aware of what I take for granted. It made me pause to be thankful for what, for us, seems like a little thing: 120 volts trickling through wires in our homes. While the summer outage drove people out of their homes and talking over fences, this outage got neighbours pausing from their ice-breaking to compare stories of loss. Tree limbs in particular have been the silent victims of this ice storm. Do we take our electricity for granted? Of course we do; the vast majority of people today who were born in North America cannot ever remember living without it. In some parts of the world – many parts, really – electricity is not taken for granted. In some communities in the two-thirds world, electric power is only available for a few hours each day. An outage, especially in the winter, reminds those of us in cold climates that electricity is innately tied with heating. Unless one has a fireplace – gas or wood-burning – or a wood stove, keeping one’s home warm in the winter relies on electricity. At this time of year, in Canada, a prolonged power outage can be a matter of life and death. Let’s take time to give God thanks for the gift of electricity. 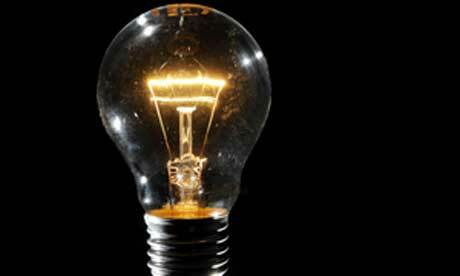 We think it was invented by Thomas Edison, but he was inspired to create a distribution system for it. God has blessed us with electricity, and inspire people to create helpful tools that enable us to harness and enjoy life with it. Let’s not take it for granted – and let’s work to ensure that everyone has affordable access to it. Here’s to keeping the heat and lights on! “Give thanks in all circumstances, for this is God’s will for you in Christ Jesus” (1 Thessalonians 5.18, NIV).